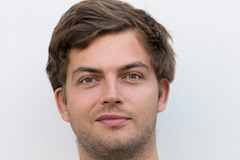 Max Pellert is a PhD candidate at the Section for Science of Complex Systems at the Medical University of Vienna and Faculty member of the Complexity Science Hub Vienna. Max obtained a Bachelor's degree in Economics from the University of Vienna and a Master's degree in Cognitive Science from the University of Vienna and the University of Ljubljana, Slovenia. In his master thesis, entitled Collective Dynamics of Multi-Agent Networks: Simulation Studies in Probabilistic Reasoning, he showed the superiority of a probabilistic version of Inference to the Best Explanation (IBE) over Standard Bayesian strategies of inference making in coin tossing experiments. He is working on his PhD in the WWTF research group Emotional Well-Being in the Digital Society lead by David Garcia.